A vintage collection of Star Wars toys and memorabilia will be returning to the town where they were first marketed and introduced to British children. 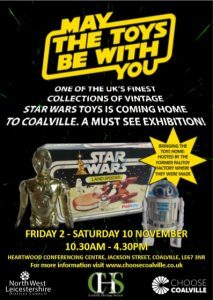 The May The Toys Be With You exhibition is heading to the exact site of the former Palitoy factory in Coalville – now the Heartwood Conference Centre – where many of the toys were made back in the late 1970s and early 1980s. North West Leicestershire District Council (NWLDC), with the support of Coalville Heritage Society and former Palitoy designer Bob Brechin, has secured the exhibition for the town, and it will go on display from Friday 2 to Saturday 10 November. The free entry exhibition features more than 300 objects from the personal collection of Star Wars fanatic Matt Fox. They include everything from rare film posters and unpublished artwork, to his collection of action figures and vehicles – some of which were made at the Coalville factory. The exhibition has proved very popular at the New Walk Museum in Leicester where it has been since July. It is estimated that 300 million action figures of characters like Luke Skywalker, Yoda and Chewbacca were sold between 1977 and 1985 when Star Wars fever hit its peak. At the height of the fever the BBC Newsnight team filmed in the Coalville factory and described it as ‘a goldmine on top of a coalmine’. The stunning collection will be returning in November to the former ‘goldmine’ that was Palitoy and will be held at the Heartwood Conferencing Centre, once the very offices where the development and marketing plans were conceived. The free exhibition will be held between 10.30am and 4.30pm daily from Friday 2 November to Saturday 10 November at the Heartwood Conferencing Centre in Coalville Business Park, LE67 3NR. Councillor Richard Blunt, Leader of NWLDC, said: “As soon as we learned of Matt’s incredible collection we knew we had to bring it home to Coalville. “Palitoy left a real legacy in this town and a lot of people have great memories of working there or had friends and family connected to the firm. Bob Brechin, former Palitoy Chief Designer, said: “I was Chief Designer at Palitoy from 1967 to 1984 and my main focus was on the development of Action Man throughout that time. When I attended a special preview of Star Wars about three months before general release I was stunned by the whole experience. It was totally toys from the dramatic appearance of the Star Destroyer at the start to the final credits. “Shortly after I was fortunate to visit Kenner in the States and witness the first mouldings being assembled for the Tie Fighter and X-Wing. “And to think that Palitoy almost passed it by, because the initial thoughts were that it was too risky to try to sell toys based on a single film – especially for what was being described as a sci-fi ‘B’ movie. Owner of the collection, Matt Fox, said: “As a childhood collector of Star Wars toys – now called ‘vintage’ toys, which doesn’t make me feel any younger – I am so thrilled and proud to be exhibiting my toy collection in the very same location where they once originated. Stuart Warburton of the Coalville Heritage Society said: “The Coalville Heritage Society is extremely pleased and honoured to be part of May The Toys Be With You. “Palitoy was a hugely important company in Coalville and has a lot of history in the town, and this exhibition will be a great celebration of that. Palitoy Q&A session to close the exhibition, Geoff Maisey talk to open between 5.15 – 5.35pm, followed by a Q&A session between 5.40pm-6.45pm. “Come along to this special question and answer session to ask a panel of former Palitoy employees all about their memories of producing Star Wars toys in Coaville. This is an opportunity to learn from various members of the team about their contribution to iconic Star Ways toys, which retain their popularity to this day. The talk will be at Heartwood Conferencing Centre, once the very offices where the Palitoy development and marketing plans were conceived. “Prior to the question and answer session, there will be a 20 minute talk from Geoff Maisey, former Star Wars Product Manager for Palitoy, who will be talking about his experiences of marketing of Star Wars products, including the initial challenge to establish Star Wars as a brand”.